Today is my first official day working from my new office. Isn’t it amazing? That’s an L-shaped desk with room for writing and editing. I’d love to take you on a tour of the whole house. Maybe I’ll figure out how after we get everything unpacked, all the furniture in place and the mega Styrofoam explosion cleaned off the floors. This is the new kitchen. Not as many cupboards as the old one – and yes, I’ve almost completely filled the lovely pantry in the corner to bursting. We ate most of our meals at the bar in our old house. You can see the bar in the foreground here. Now we have even more room at the new bar, but we don’t eat there. It isn’t because of the clutter. Aside from scarfing down pizza on the first night – in between hauling boxes galore – this place has been lonely. The beautiful new dining area – only steps from the kitchen and the great room. Can you see why we would rather eat in the lovely room at this cozy table? Tonight will be the first “solo” meal for hubby and I without the kids, so maybe the bar will feel intimate enough for the two of us. The move is finished. I can’t use that as an excuse for the lack of words flowing onto the page. Time to do what writers do…play with imaginary friends all day. For a week before the big day, I deep-cleaned some room or focused on brightening the appearance of another room. My son got enlisted to scrub floors (in addition to toilets) and dust off the ceiling fans. I’m not saying I own too many pairs of shoes (an impossibility in my world), but I had to remove all of my boots so the floor of my closet was visible. Apparently, anything that looks like clutter has to go! In the hours leading up to the event, every floor got cleaned and every surface was set to sparkling. Lit candles added wonderful atmosphere. Fresh-baked peanut butter chocolate chip cookies invited people in to stay. My husband agreed to be the guide of the upstairs and I would be the official greeter. He put a movie in the DVD player – something that seems to be happening in every house we’ve walked through – and settled in. I parked myself with my iPad in a chair facing the front door. Breathing deeply, I practiced my casual, welcoming smile and greeting. We’re ready. Let the games begin! My husband comes down and snags a couple cookies. He gives me an encouraging grin. I decide to read a collection of short stories on my Kindle application. This way, it should be easy to set things aside when people show up. Ready, set…Begin – anytime now. May the odds be ever in our favor! I’m reading the encouraging comments from my friends on Facebook. I’ve moved to the kitchen counter so I can visit blogs and post comments. After all, I have a platform to build. Apparently, things started happening in The Avengers because I didn’t see my husband for quite some time. Later, I learn he has fallen asleep. I’m pacing to the front windows every few minutes. I stare out at the Open House sign and mentally will people to pull up. Apparently, this is not one of my super powers. Every sound outside perks up my ears, and I think someone is finally coming to see all this work I’ve done. All this cleaning and straightening won’t be for nothing after all. My husband comes downstairs and reminds me that most people will come later. Any time now, they’ll start showing up. I must have been insane to dedicate five hours on the second day of National Novel Writing Month to something like this. Who knew it would be a total waste of time? Even real estate agents plan to get paperwork done or catch up on reading when they host an Open House. Why did I expect anything different? Okay, I didn’t. I did hope someone would come to see the house, though, even if they were just out for a drive and saw the sign. Instead, I wasted hours cleaning, straightening and fretting about every little piece of lint in my house. Further, I didn’t get to meet my writing goal of 3,000 words for the day because I knew I would be a bear if interrupted during my writing time. When someone asks if we’re having another Open House, I don’t feel like slapping them anymore. I laugh. Sure, if I want to waste a week of my life. Why not? Do you have any experiences with trying to sell a house? Maybe you’ve experienced another time when you’ve gone overboard preparing for some event and then it failed to meet your expectations. Of course, I’ve talked about that whole expectations thing before. What was I thinking? “These are so gross. This needs to be done annually.” Thanks for volunteering, son! Some people call it Spring cleaning. 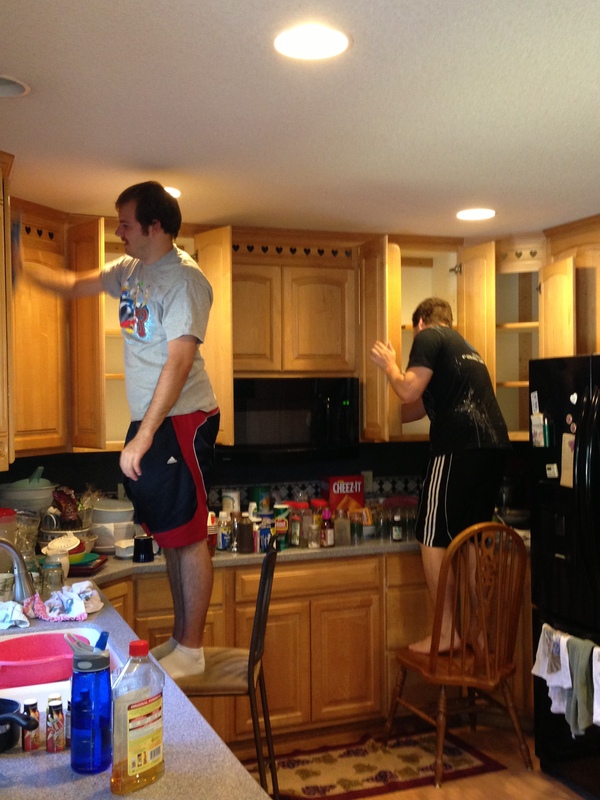 My mother said we were “deep cleaning,” but by any other name washing walls (and cabinets) is still work. I’m fortunate to have two strong and tall sons. They still had to climb up on a chair to reach the top shelves of the kitchen cabinets. I ask you: does it make sense to have a shelf you cannot reach? What should you store on such a shelf? I had my son retrieve a collection of cookie and candy tins I have been collecting over the past many Christmas seasons. I wanted to keep them so I could bake cookies and give them as gifts. Needless to say, a few went in the garage sale box, one went in the garbage bag and the others went back on that impossible-to-reach top shelf. We had a process for cleaning the kitchen cabinets. I pulled the stuff out and set in on the countertop. This way, I could move the items for sale to the garage sale box and dump the junk in the garbage bag. Behind me, my oldest son used regular soap and water and a rag to wipe the inside of the cupboards. After he dried them, I placed the “kept” items back inside. My youngest son used the bucket of Murphy’s Oil Soap and water to wipe down the outside of the lovely maple cabinets. I ask you: who did the most work? Especially since I also cleaned, wiped out and organized the bank of drawers by the stove and the other drawers that hold all the silverware and utensils. Who do you think complained and had to be compelled to continue working? Yeah, the same one who volunteered for what he believed would be the easiest of the jobs. Silly boy. He forgot that I’m the “mean mother.” I made him do the inside and out of the freestanding pantry. It is, after all, wood on all sides. Just like the other times I’ve asked them to help clean the house, I provided lunch. They picked out the pizza they wanted. I told them to order cheese stuffed breadsticks, too, if they wanted them. Washing walls and cabinets ranks right up there with scrubbing toilets and cleaning grout with a toothbrush. I understand their reluctance toward participating in these tasks. And I was graciously thankful that they were here to help me with it. I would have had to spend an entire day on the project, but the three of us could finish in three hours. I’m clearing off the counters and making it look sparkly and shiny. My husband will get his camera out and take pictures for the online scrapbook we’ll use when we attempt to sell our home. Hopefully, prospective buyers won’t be too shocked to see the cluttered version when they arrive in person. It’s hard to keep all the junk off the counter when people keep mailing more every day. What’s your least favorite cleaning task? Do you have a cleaning horror story to share?